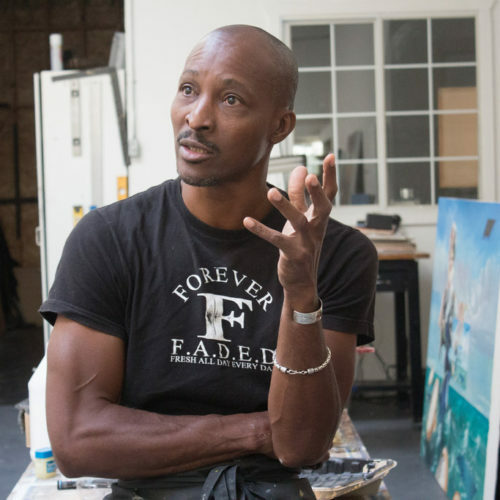 Patrick Henry Johnson is an internationally acclaimed visual artist based in Los Angeles. His work spans from designing colossal murals as a public art form to fine art as the illustrator for May May Ali’s, I Shook up the World children’s illustrated book about her father, Muhammad Ali. Patrick Henry Johnson’s work can be seen in various parts of the city transforming walls and communities. He is the first artist to have a mural sponsored by the city on private property since the mural ban was lifted, a project commissioned by Council Member Curran Price of the Los Angeles City Council. This 72″ x 14″ foot mural depicts the cost of war to the human soul. The piece is titled The Penta-Loom Ode to Soldiers. His latest project is titled The Chronicles Of Subjugation: The Art of Conquer and Divide! , featuring assemblage installations that challenge the presence and the way we react to race and prejudice in our society.